Today we're proposing a new feature to the Meta Stack Overflow community: Stack Snippets. What do Stack Snippets do? You can combine these three languages as you'd please to create runnable code for others to try out. The goal of this feature is to encourage users to create minimally viable and functional code when asking code-centric questions. Answers could then be in the form of a stack snippet which resolved the question at hand. 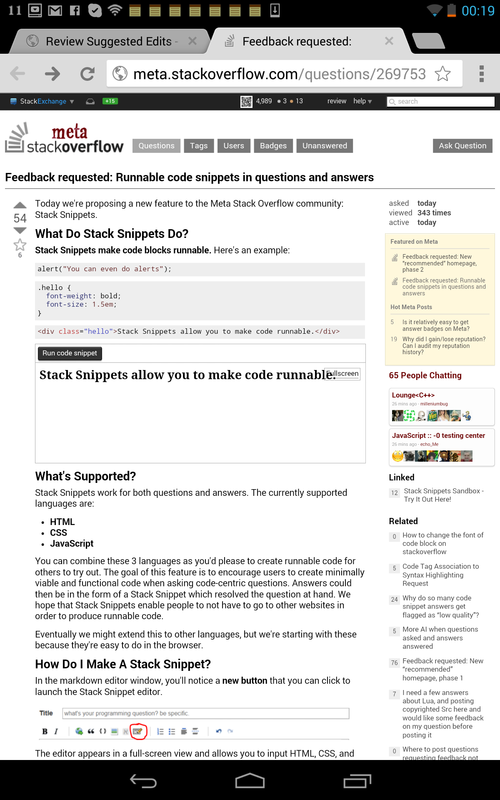 We hope that Stack Snippets enable people to not have to go to other websites in order to produce runnable code. Eventually we might extend this to other languages, but we're starting with these, because they're easy to do in the browser. How do I make a stack snippet? 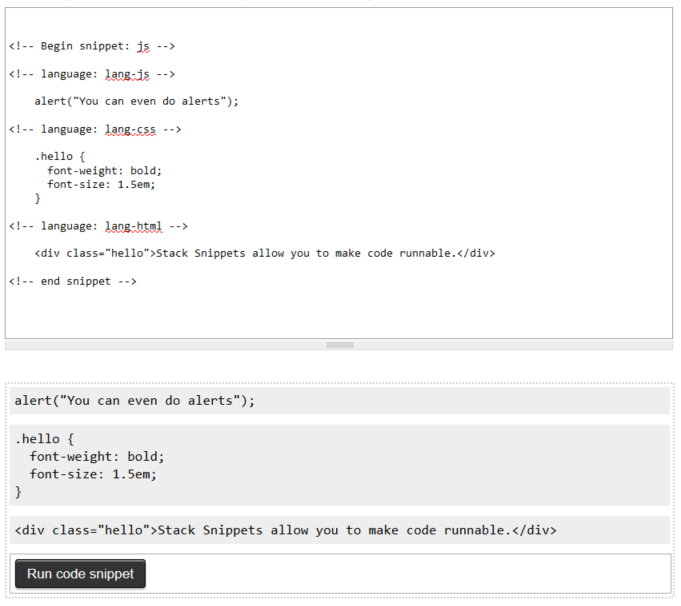 In the Markdown editor window, you'll notice a new button that you can click to launch the Stack Snippets editor. When you're done, press Insert at the bottom to insert your stack snippet into the Markdown text. It gets inserted as regular Markdown code blocks plus some comments that aren't rendered, so they're backwards compatible with revision history, diffs, etc. 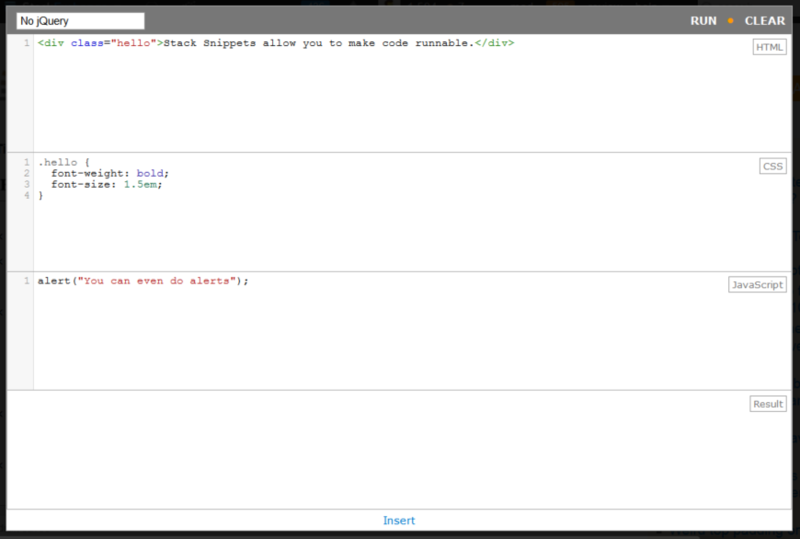 You can even edit the code right in the Markdown text instead of having to use the full-screen editor. Every question is better for having minimal, reproducible code. Right now the best way to tell people to do that is to point them to JSFiddle, which is off-site. Using this feature, we plan to push new posters to embed runnable code that reproduces their problem. Similarly, answers that include runnable code are easier to use and understand, because you can try them out. Obviously JSFiddle is hugely popular in answers already, so we just wanted to make it even easier to use. Obviously the same rules apply: code-only questions or answers will still be blocked (and, in fact, because of how it's implemented all the existing checks will just work out of the box). Currently, Stack Snippets will be active for any browser which supports HTML 5's iframe sandbox feature. This mostly aligns with our goal to support 2 releases back from the current version of all modern browsers, with the exception of IE9. See this link for more information. When inactive, Stack Snippets gracefully render as regular code blocks, so that the code is still a part of the question or answer. Here's a sandbox for trying out the feature. Right now it's only turned on on Meta Stack Overflow. Feedback is definitely welcomed and appreciated. Provide a button that allows us to "fork" a snippet into an answer, with highlighting of differences between the original and the "forked" version. Easily make the changes visible in the answer, for illustrative purposes. We outsource a lot of content to JSFiddle, so having Stack Snippets onsite would certainly help (though it does negate the need for a userscript I've been working on...). this will work for you thx. Our goal here is to not only help the OP solve his/her problem, but also to teach him/her to solve problems on his/her own. If we allow people to answer with the exact same code + fixes applied, the OP will come back again and again asking for debugging help. We value answers that explain the problem and how to fix it, so adding something like this could be dangerous without the proper restrictions. Perhaps a character restriction or forbidding common phrases like "try this" (I know that this is frowned upon, but it's already in use, anyway, so we may as well use it here) would encourage people to explain their code (there will always be those people who do "...lots of text so I can post answer..."), but there has to be some way to encourage people to do this. (Feel free to comment with ideas.) Code-only questions are forbidden, but code-only answers are still allowed (for whatever reason), so anything is an improvement. As long as the rules are made clear (put it in the tour or something: don't just leave it as an obscure menu bar time without any context or guidance), this could be an immensely helpful tool. This is an awesome idea. It would be even more awesome if you supported additional languages. This seems like a really cool idea, but I'm starting to doubt its value. It is possible to implement it without setTimeout using window.getComputedStyle. I'm concerned that encouraging use of this feature over jsfiddle.net will cause people to include more 'irrelevant code'. This means longer questions and answers. It isn't as easy to edit. Having the full operational code and separators inline makes for longer source code on the post. I'd say this pushes the limits of what Markdown is intended to be. You could create a better rich text editor to keep people from having to work with Markdown directly so much. That's probably more trouble than it's worth though. Remember, not everyone can use Markdown as well as you or me, and even if they can, that doesn't mean it's a fast job. As proposed, I'd say this feature would cause more harm than good, because it would result in an increased average length in questions and answers, and too much inline activity when you expand/collapse the fiddle display. jsfiddle.net works, perhaps you should follow that model? Keep the 'fiddle' code separated from the 'posted' code. You can either continue to use jsfiddle.net or create a new stackfiddle.net or whatever. Focus on improving on this model rather than re-inventing the wheel. Limiting this to JS/CSS/HTML seems a bit restrictive. The usual coliru-style online compiler offers many language implementations. Answers could then be in the form of a Stack Snippet which resolved the question at hand. This is just going to encourage code-only no explanation answers, as well as questions. Including a Stack Snippet would be nice. Snippet-only questions or answers would not be nice. There should be a way to close the snippet when done. It should not 'break silently' just because you don't use semicolons. The snippet creator form could use some aesthetic improvements. 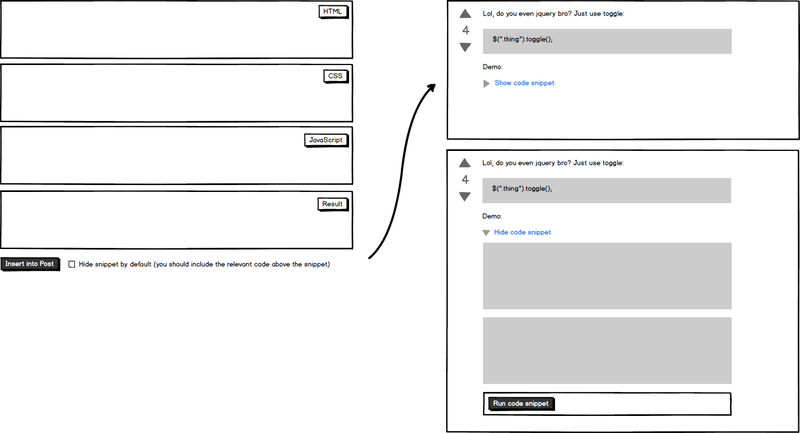 Perhaps use the quad view like jsfiddle.net, add an actual close link, etc. Is it supported or not? If not, please make it available for touch devices. Can I suggest finding a better way to separate the three code blocks? They sort of run into each other a bit at the moment. And what version of HTML will be used for any given snippet? Needs to be clearer as sometimes this is important. The perfectionist in me is disgusted by casing of the word "Begin" in <!-- Begin snippet: js -->. It should be "begin" instead to match "language: lang-js" and "end snippet". There are for sure other, neater ways, just can't think of one. As it is, for me, if answer requires a lot of boilerplate, possibly already included in the question, I will resort to jsfiddle. If it is bearable, I will definitely use Code Snippet. External files are not a problem! Just include them in your HTML the way you would for any other site. What about security? Seems easy to abuse by someone trying to get the unwary to run some trojan on their computer. While a lot of the visitors here may be capable of detecting such attempts, your average homework kid who's the likely person to be wowed and click the "run" button isn't (and neither will be someone not familiar with the ins and outs of a specific language). In itself the idea is neat, but I have serious reservations because of that. And of course if the code posted needs any external resources or libraries to function (and which code except the extremely simplistic doesn't?) it's not going to be of much use. There are several problems with this feature. For example, long running scripts and infinitely long running scripts which will hang / crash the browser. But more importantly, while this feature might be secure for Stackoverflow's servers, it is definitely unsecure for Stackoverflow's users unless we can solve the phishing problem as demonstrated by my post on snippet sandbox which requires nothing but the innocuous window.location.href. While there are certainly users who may spot these in-domain phishing attacks and flag them for removal, it might indeed be already too late. Phishers can get extremely creative, but I suppose all in-domain phishing attacks can be prevented by disallowing all external redirections —window.open, window.location, a href, etc— and all external embeds —iframe src, frame src, script src, img src, object, embed, and CSS / favicon's link href, etc—. Unless this gets expanded to allow linking to external libraries, I don't see a ton of reason to use it over jsFiddle. For instance, answering Bootstrap questions without being able to demonstrate how it works tends to be a losing proposition. Then there's the questions dealing with, say, FontAwesome, where (again) being able to load an external resource is critical. 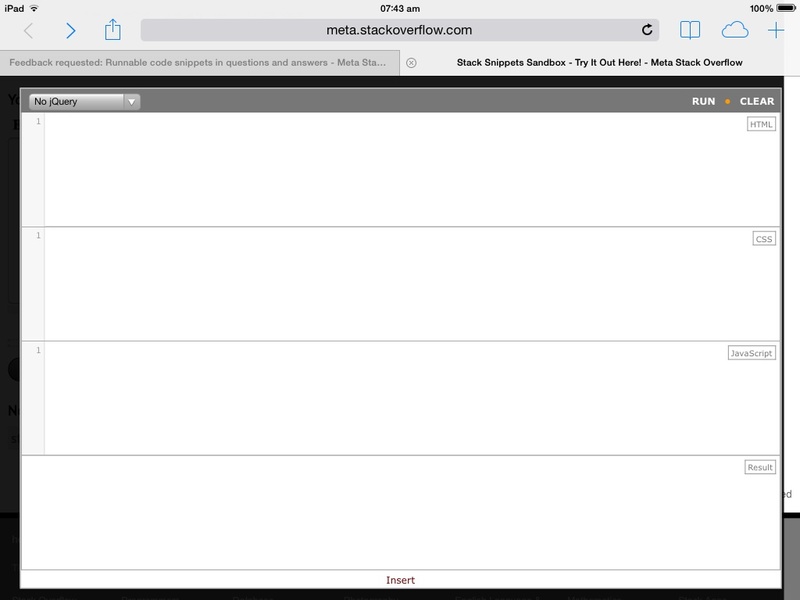 Perhaps a better solution would be to fetch the contents of a linked jsFiddle and inject it into the answer? There's always the embedded fiddle, too. Small annoyance: The "Run code snipped" box is added after the page is loaded: this causes the page scroll position to be incorrect. For example, here is a link to a comment at the bottom of the sandbox page - The page loads nicely and points to the comment, but after the "Run code snipped" buttons are added to the page, the comment jumps down. If you guys are interested in integrating .NET Fiddle (https://dotnetfiddle.net) for code snippets in C#, VB.NET, F# and ASP.NET MVC, please let me know. My email is dotnetfiddle at entechsolutions dot com. I see that one of the reasons you decided not to integrate with jsFiddle was because of stability. While .NET Fiddle stability is pretty good, to be integrated with Stack Overflow it can't be just "good". It has to be great. The fiddles can appear interactively (with auto complete, live syntax validation) directly on the Questions/Answers. Or they can appear in read only mode, where you click on Edit and it opens up a popup or another window, like you are doing with Stack Snippets. As to UI, we are very flexible. We can provide API if you would like fully custom UI, or we can provide UI using Widgets where code editor and result will be displayed in IFrame and handled by dotnetfiddle.net. I just edited another answer. It had an HTML block to which I added a CSS block. There was no way to launch the snippet in an edit view. The button seems to work only for adding new snippets. To edit an existing snippet, I had to work by hand. I added the CSS block after the existing HTML block, but the CSS appears first in the rendered view. Why? //Append a child element to the DOM body. Can we please have the same for SQL? Many answers in the SQL area use SQLFiddle to build a minimal, reproducible code. But often the site is down. When you click on the "Run code snippet" button you should be able to minimize that box that appears so it's not so big. For example the images below shows that the box can be quiet big, it would new nice to be able to minimize it. At least encourage code comments. Inline snipplets are obviously not just a cool feature, but they also help with answer coherency. It'll certainly succeed in avoiding the core solution being dispersed to off-site resources. There's however an easy opportunity to raise the arts here. Just have the editor include a preset single-line comment for the scripty sections. If left unchanged from, for example, // Please comment your code, it can as easily be stripped on inserting the answer snipplet. When an answer has a low enough score (e.g. -3) disable the "Run code snippet" button, or add a warning "Sure you want to run the code?" before actually running it, as it usually means something is wrong with the code. The Full Screen experience is a little jarring. When you take away all of the content, I immediately go to my back button to return me to the question page. As it works right now, that actually takes me away from the question page. and show the output "a=10" somewhere. This would cover many algorithms, regular expressions, and simple constructs. C, C++ may have similar assumption rules. Without this, indeed, most answers will become unnecessarily long. Most of the code in the answers are fragments of the code, not a complete ready to run applications. Great! I would love to see support for more languages though, like http://ideone.com/ does. Great idea to reduce the dependency from the external resources (jsFiddle). However, maybe I'm blind, but I can't find out the way to edit the snipple in that cool editor again. It appears only when inserting a new snippet. When editing the post, the empty snippet editor is shown. users should be able to turn these "additional" features on/off, with graceful degradation. You don't trust the executable snippets? You just see it as a text box. consider a way for (experienced) users to contribute "plugins", without access to the SE codebase. Obviously you can't support all the languages in the world: what if I know an esoteric language (or a less popular one, like x86-asm or scala) inside out and I would like to provide "snippets" for it? Please consider allowing us to decide whether the snippets should be displayed or not. Certainly, we need to provide the snippets in order to generate the demo. That said, ofttimes the important part of the answer can get lost in that amount of text. alert(a + b); // "herpderp"
<pre><code> doesn't seem to work with code snippets. That's fine, I'll use them separately. However, that means that I'll be doubling up on the code displayed to the user unless I'm allowed to hide the demo source. Let me start by saying that I think this feature could have a lot of potential. However there are big time security risks. It seems that everyone keeps assuming that questions will contain concise, easy to read code allowing a browsing SO member to come to a conclusion about the safety of running a snippet of code via a quick inspection. HOWEVER, we simply know better than that. Don't click the gray squares...you have been warned. Running this snippet will load espn.com in an iframe. What's wrong wiht thas codez? Now, I elected to load ESPN.com in this example because I'm not trying to get people in trouble here. I could easily have obscured the URL even further. I could have easily obscured the creation of the IFRAME element even further. I could've hidden the iframe so the user didn't see it. There is inherent danger here. I hope that I've illustrated that well. 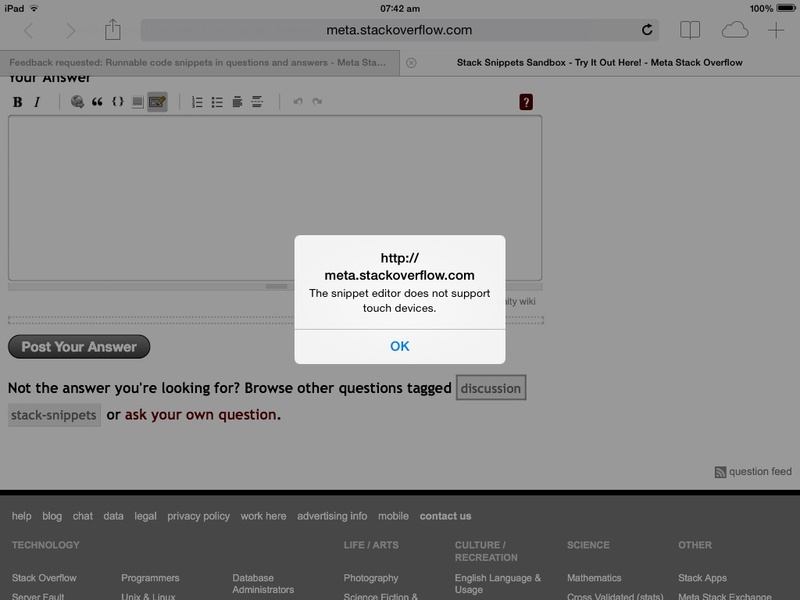 Yes, a link to off site like jsFiddle could still embed malicious code. The point is that it is offsite. It's not StackOverflow. It's not affiliated. It gives StackOverflow the option to deflect responsibility. That's my advice, as nifty as this feature is. Stack Overflow & run code snippet? Should Code Snippets be reengineered like fiddles? What about c code snippet in questions? Are 10K users less gullible? How can I improve my own experience of Stack Overflow? Can code-only answers be high quality? Is it OK to edit a users code question to utilize the Runnable Snippets? Why can't snippets be used in documentation and tables in questions?